The refugee oligarch explains why Yushchenko fears Tymoshenko, and describes the anti-Putin attitude of the orthodox church. -Why, in your opinion, cannot NUNS and BYUT form a coalition in the VR and appoint Yulia Tymoshenko Head of Government? - The problem is, unfortunately, purely personal. It concerns the personal relations between Yushchenko and Tymoshenko. And it is these relations themselves, that unfortunately, are seriously harming the democratic process in Ukraine. But since alternatives to their union does not exist, in the final analysis, they will be able to find a compromise. - Why does Yushchenko so oppose Timoshenko's premiership? - He is quite simply scared of her. He fears that she will become the real political leader of the country. He really fears that Tymoshenko will formally realize her leadership and will become the next President. And will Tymoshenko be President? - If she puts forward her candidature, then she will become President, beating both Yushchenko, and Yanukovych. Incidentally I do not envisage a strategic future for Yanukovych. The Party of Regions could split into two halves. The 'sovok' part will go with Yanukovych, while the 'biznesovaya" part with Rinat Akhmetov. He needs to somehow legalize himself in the West. And the FSB [Russian Federation Security Services] will not help him, if they begin apply pressure on him. - Let's switch to the situation in Russia. What is Putin trying to attain? What will happen to him after selections? - Putin is searching for ways of retaining power - [his own] personal and centralized [power]. Right now he thinks that he will enter the Duma, and then will return and be elected for a third presidential term. Someone will have a brief spell as President after him, they will then leave, and Putin will return again. In any case, this is what he wants. - So who can be this short-term President of Russia? Zubkov, Sergey Ivanov, Medvedev? - [It will be] the man who Putin will trust to head the country for the intermediate period. But no-one will carry out their obligations to him, if they becomes President. Neither Zubkov nor Ivanov nor any Medvedev. Putin will lose power to him in any event. And as soon as he loses it, then in the final account he will find himself on the defendant's bench [in the dock]. - Ivanov, Zubkov or Medvedev him will put him there? - Yes. Any of its successors. Because they will want to disassociate themselves from the crimes of Putin. The regime will mover a little to the side of liberalization, but, in essence, it will remain before. - But who will then overthrow this regime? Kasparov, Nemtsov, the Communists? - The most likely, undoubtedly, Kasparov. Nemtsov has also changed for the better, but SPS, and Yabloko, and Communists - these are not real opposition. The real opposition are in the underground. I do not want to name concrete names in order not to help FSB, but I'm talking about groups of influence which are located in business-circles, the power structures, and in the orthodox church. - With your permission, I'd rather not comment of Georgian matters." Berezovksy is enemy #1 for Putin - Aleksandr Livinenko's poisoning and dreadful death last year may have been the result of his closeness to Berezovsky. The popular Rinatov-owned 'Segodya', is clearly not afraid of providing Berezovsky column inches on their pages. Nor, it seems, are they afraid to air Berezovsky's speculation on the future of PoR.. So, a BYuT-NUNS coalition of 227 was assembled today. LEvko thinks it rather resembles one of the circus pyramids formed by tiers of wobbly gymnasts standing on top of one anothers' shoulders...how long before it collapses? Maybe the guys at the top will be able to cling onto the lights and scenery above the stage when it does.. Or will some of Lytvyn's people step in at the last moment? Anyway, they did it..the photos have been taken to prove it.. Check out this article from Anders Aslund on the myth of Putin. 'Moscow Times' articles go to 'subscribers only' status quite quickly, so don't delay. "If these numbers [in the article] contain any truth, Putin would be the most corrupt political leader in world history...Abundant oil revenues have made it possible for Putin to avoid difficult reforms and to allow his inner circle to indulge in some of the worst corruption the world has ever seen." Events it seems, are following the usual well-rehearsed script..
Oles Doniy, a NUNS VR deputy explains at a press conference what's going on. "At the same time, [Doniy] believes that an informal coalition between the Secretariat and the Party of Regions has been already created. "I can state that an informal coalition between the Secretariat and the Party of Regions is taking shape," he said. Doniy is sure that the aim of the NUNS - PR coalition is to not let Tymoshenko gain strength before the presidential elections. In this situation, Doniy continued, the aim of the Party of Regions is to elect the Verkhovna Rada chairman from among its candidates and keep the post of acting prime minister for Party of Regions leader Viktor Yanukovych." The Party of Regions and some members of the Our Ukraine People's Self-Defense Bloc, who favor the broad coalition, have enough votes to elect Yurii Yekhanurov, Ivan Pliusch or Mykola Onyschuk as parliament speaker." Others say that if Kyrylenko withdraws his bid to be VR speaker, and NUNS propose a compromise figure, then an orange coalition would become more likely. The desire to honour the memory of ancestors who suffered and died in the Holodomor is strong in the Eastern, predominantly Russian speaking parts of the country too. Hundreds of thousands of candles in the squares, the cemeteries of Donetsk and in the windows of its inhabitants over the weekend blazed grief for those innocently slain by the Holodomor. As the rays of the sun set on the central cemetery of Artemovsk a mass of people assembled to honor the memory of their innocent compatriots who died in 1932-33. To the sounds of a sorrowful melody, lighted candles were placed at the foot of memorial to the victims of the Holodomor. Together with them was placed an additional symbol of terrible tragedy - a sheaf of wheat with the tight ears. It stood on the black granite framed by the flickering flames..."
"Dnipropetrovsk region installed on November 23 a five-meter stele in memory to the 1932 - 1933 Great Famine (Holodomor) victims near the village of Pereschepyne on the border with Kharkiv region. Ukrainian News learned this from a report of the press service of the regional state administration. The stele [?] has a form of a fractured scale with an iron cross placed in its center, the report reads. «The memorial sign was put up at the cost of the local public, including businessmen,» the report says. Dnipropetrovsk region has 83 monuments to the Holodomor victims." Yesterday President Yushchenko delivered speech [in English here] at the ceremony in Mykhaylivsky Square, Kyiv, commemorating the 75th Anniversary of the Holodomor. It's powerful stuff. "Evil advanced against us. Its name - genocide. A deliberate, planned and embodied attempt to suppress the nation. Its organiser and executor - the totalitarian communist regime. They were the main killers. This degenerate gang had no mercy for any peoples, every subjected nation was filled with rivers of blood. In our land, Stalin in accordance with a deliberate plan, chose to victimize Ukrainian peasantry because they were the core, the basis, the support of nation. 'Without a peasants' army, there is not, and there cannot be a powerful national movement. The national question in its essence is a question of the peasantry'. These words of Stalin provide the answer to the question: why did millions of Ukrainians die?" Mark Franchetti [of the 'Sunday Times'] gained unprecedented access to former KGB agent Andrei Lugovoi, the prime suspect in the poisoning in London of former FSB officer Alexandr Litvinenko, for the totally absorbing, and somewhat disturbing, BBC 'thisworld' program entitled: 'Britain's most wanted'. An absolute 5* 'must-see' for anyone interested in contemporary Russia..
Watch it here . Don't miss it. Has his self-exposure in this programme made Lugovoi appear, in the eyes of a viewer, more, or less guilty of the charges confronting him? The first sitting of the newly-elected Ukrainian Parliament, the Verhkovna Rada, took place today, and a recess promptly declared until next Thursday. "They need time in order to continue to bribe deputies. They want to win a few days.."
She called the ajournment: "an absolute infringement of the reglament [procedural regulations]", and declared that her fraction will attend the VR on Tuesday. She expects NUNS to do the same, hoping that the total number attending will be an orange 'full house' of 228 - sufficient to pass resolutions. And when will we see any solid evidence of bribes being offered? There are reports that 8 NUNS deputies have not signed an agreement on democratic coalition. If they were to form their own coalition, PoR -Communists -Lytyvn bloc , could only muster 222 votes maximum in total between them. Add 8 renegades from NUNS, maybe a handful from BYuT, and this still does not provide, in Ukrainian terms, a workable majority in a 450 seat VR. The presence of Communists in this coalition would be a big problem for anyone else thinking of joining them..and Lytvyn is well aware of what happened to Moroz and the Socialists after they teamed up with PoR last year in the VR, so will be most cautious about any such arrangement. He may well prefer to remain non-aligned for the time being. This is all going nowhere fast. Privately, the current Yanukovych-led cabinet, and the President, will not be too unhappy about that right now..
Excerpts below from an article in RFE/RL entitled "Colored Revolutions: High Hopes And Broken Promises"
"Some consider the Ukrainian east-west divide to the be a source of internal weakness. But others, such as Georgian political commentator Bakur Kvashilava, argue that it holds the benefit of laying the groundwork for the establishment of democratic principles and procedures. "Such regional disagreements complicate governance of a country, of course," Kvashilava says. "But long-term, as history and other examples teach us, if two opposing sides can agree on one fundamental issue -- that Ukraine must be integral and undivided, for instance -- then chances are they will also agree on a second fundamental issue, that the only correct path for coming to power is the democratic one -- elections, referendums." There has been a clear effort to solve all political crises -- no matter how acute -- through negotiation and accommodation in post-Orange Revolution Ukraine. For Kvashilava, this indicates that democratic procedures are finally taking root in the country's political culture, creating a telling contrast with Georgia. "In Georgia, as the recent events demonstrated, it was absolutely legitimate and acceptable for the population, as well as some representatives of the opposition, to call for the president's resignation, [the opposition's] assumption of power, 'saving the people' and so on," Kvashilava says. "The majority of protesters applauded these slogans -- and this indicates that democracy, as the only way of life, in Georgia has not been established as firmly as in Ukraine." Ukraine's regional and linguistic diversity has also served as a basis for less radical shifts in foreign policy. While in Georgia most political forces -- and certainly the one in power -- are openly pro-Western and have expressed the desire to distance Georgia from Russia's influence, Ukrainian politicians have been more restrained and cautious. "The checks and balances that exist in Ukraine, because of various divisions within the country, meant the Ukrainian government, while it was always very keen on close relationship with NATO, was never able to go flat out and seek NATO membership, or the initial Membership Action Plan," Redman of the Economist Intelligence Unit explains. "Whereas Saakashvili has had a very free hand in Georgia, and was able to do that. So he was more out-and-out pro-Western, pro-NATO, than the Ukrainians ever managed." But that approach has come back to bite Georgia in another sense, as it served to strain further its already deteriorating relationship with Russia and has fueled aggressive rhetoric by Russian politicians who can't afford to show the same hostility to Ukraine, lest they risk alienating Russian-speaking Ukrainians." LEvko's observation is that Russian politicians have already alienated many Russian-speaking Ukrainians over several years now, and continue to do so by their overbearing attitude. Ukrainian politicians and businessmen will not be cowed by those from the north. They know them too well - know all their games - they all used to pi** into the same pot in the days of the Union. Ukraine and Russia are now much different countries - and the blue water between them is widening..
"Increasingly more Ukrainians recognize the Holodomor as genocide. The overwhelming majority of Ukrainians in all regions are convinced that the Holodomor [famine] of 1932-1933 was caused by the actions of the authorities. An opinion poll reveals, this point of view is supported by 72,4% of citizens questioned by the Kyiv International Institute of Sociology. In the last year the percentage of those questioned who consider the Holodomor of the 30's being caused by the authorities at that time, has increased in the Ukraine from 65 to 72% - in the eastern part of the country- from 46 to 57%, in the center - from 73 to 82%, in the south - from 59 to 65% and the west - from 80 to 85%. Only 12% consider that Holodomor of 1932-33 was caused mainly by natural circumstances. Almost two thirds (63,2%) of those questioned fully or partially support the acknowledgement by the Supreme Rada that the Holodomor was an act of genocide against the Ukrainian people, 11,9% wavered with their answer, and 2,9% know nothing about it. The acknowledgement of the Holodomor as genocide was supported by the supporters of the main political forces as follows: 93% of NUNS supporters, 84% of BYUT's supporters, 75% Lytvyna bloc supporters, 43% - Party of Regions. 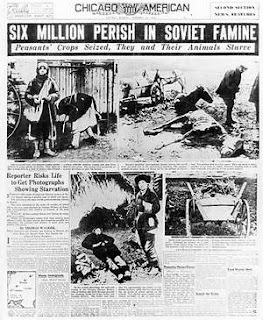 Amongst Communists - 50% do not support the acknowledgement of Holodomor as genocide, but 41% do. It is remarkable that in comparison with the results of similar questioning carried out exactly year ago, during November 2006, the number of supporters who support the acknowledgement of the Holodomor as genocide has increased from 60,9 to 63,2%. 2041 respondents aged 18 and upward throughout the entire territory of Ukraine were questioned . The statistical error in the sample does not exceed 3,5%." The Ukrainian side has not yet had any reply from the Russian Federation about the quantitative and qualitative characteristics of the cargoes being carried by the sunken Russian vessels in the Kerch strait, or any details of the vessels' proprietors. The ministry of the environment notes that the absence of information is hindering the evaluation of damage sustained by the surrounding environment." Lots more detail on the pollution caused by Russian vessels here. Ukrainian minister of transport and communications, Mykola Rudkovsky, claimed several days ago that the captains of the Russian vessels which sunk during the storm did not adhere to warnings and recommendations provided by Ukrainian coastguards and so bear full responsibility for the ecological damage caused. European Union officials are already actively involved in clean-up operations. The Russian side is behaving in a stereotypically cavalier fashion toward its closest neighbour yet again. What is it with these guys? Yesterday's catastrophe on the Zasyadko mine could be the worst in Ukraine's entire history. Who is guilty? Natural forces [stikhiya] again? Wives spoke directly and to the point, and cursed the mine's management. "My husband in a month earns only 2000 hryven. Lord, do not bring it about, but if they killed him for this money, then I will bite Zvyagil'sky myself, even if only his leg (Zvyagilsky is the honorary President of Zasydko mine). I will bite him. I swear, I could not kill him - his guards would not allow it, but I could bite him!" said miner's wife Natalie Piskun. Donetsk miners told us, often the explosions of methane occur because sensors which detect the level of methane, are deliberately 'de-tuned' in order to understate the level of dangerous gas. "While the methane content is higher than standard, coal cannot be extracted. It is necessary to wait until the work site is ventilated, but this means that less coal will be dug, on which wages depend, and the main thing is revenue for the owner of mine," explained a former electrician from the mine Vladislav K. The Zasyad'ko mine employees do not blame the board of directors directly, but they assert that "recommendations" usually come from middle managers. According to Vladislav, he repeatedly encountered the practice of the "introduction of corrections" into the work of sensors. Most frequently instruments that measure methane are simply placed on the ground where there is less harmful gas, and if this does not help they they are disconnected. Sometimes a sweater is simply hung over the instrument. Those who do not want to do this kind of thing are quickly dealt with. "Once a section chief asked me, why is the coal cutting combine not working? I answered, that the gas situation does not make it possible to conduct work. After several days they transferred me to another section where they pay two times less. My place was taken, it seems, by a more compliant fitter." According to the miner, several months after this, an explosion took place in his former section, killing 20 of its friends. Another miner says new equipment is now installed in the mine, and the measurement data is fed to the surface dispatcher, but if it is desired, it is possible "to correct" the data there. The 'Segodnya' article does temper these statements a little, suggesting that the explosion may indeed have been caused by and unexpected release of methane. The edition even ran most of BYuT's statement on the tragedy which says priority number one should be safety of working in mines. Normally Segodnya is disparaging in its comments about BYuT. November 2007 - 63 deaths and many more unaccounted for at time of writing.. It it is difficult to image what it is like to earn a living in such a death-trap where fatalities occur with such gut-wrenching regularity - a mine is not a battlefield or a war zone. The poor miners of Donbas deserve better..
Also at the site are presidential secretariat head Baloha, and national security and defence council secretary Ivan Plyushch. How long will Ukrainian miners put up with these unworthy leaders who are more interested in feathering their own nests than improving the lot of the working man? 'Ostrov' points out that several years ago a road in Donetsk was named in honour of the Zasyadko mine boss Yukhym Zvyahilsky, a former acting prime minister of Ukraine, and now PoR VR deputy. How ironic that this is the road that leads to the cemetery where dead miners are normally buried..
Today Russia's national soccer team lost a crucial Euro 2008 qualifying game against Israel. Had they won, England would have been all but eliminated. Following what some English newspapers are calling a 'Miracle in the Holy Land', England now need only to draw against Croatia at home to reach the finals.. simultaneously eliminating Russia. Much more sinister: today the Ukrainian Ministry of Foreign Affairs sent a note to the Ministry of Foreign Affairs of the Russian Federation demanding a swift investigation and bringing to justice members of the Eurasian Union of Youth who allegedly trashed a Holodomor exhibition in Moscow earlier today. These are the same guys who also allegedly trashed Ukrainian national symbols on Ukraine's highest mountain, Hoverla, and conducted a cyber attack on President Yushchenko's website recently. "Europe’s main election monitoring group said on Friday it was scrapping plans to deploy observers to Russia’s forthcoming parliamentary elections in a decision that could cast doubt on the integrity of the poll. The Organisation for Security and Co-operation in Europe claimed Moscow had imposed “unprecedented restrictions” on its activities. Russia had slashed the number of observers it would admit to the December 2 election and then repeatedly delayed issuing visas for OSCE monitors. The move marks a new low in diplomatic relations between Russia and the west, following clashes over energy, the expansion of Nato into the former Soviet Union and US plans for missile defence bases. The west accuses Russian president Vladimir Putin of suppressing democracy while the Kremlin claims the west seeks to interfere in Russia’s internal affairs." Check out the OSCE site for more. "The public prosecutions’ office in the British Virgin Islands has told the US government it has “overwhelming evidence” that Leonid Reiman, Russian telecommunications minister, is the “true beneficial owner” of a fund that owns a large part of Russia’s telecoms industry. In a letter to the US justice department, Terrence F. Williams, the BVI’s director of public prosecution, said BVI investigators had prepared preliminary charges against Jeffrey Galmond, a close associate of Mr Reiman. The letter alleges he concealed the minister’s role as the beneficial owner of Ipoc, a Bermuda-based fund that owns a chunk of Russia’s telecoms industry, including Megafon, the mobile operator. The disclosure looked set to deal a fresh blow to Mr Reiman, an ally of Vladimir Putin, the Russian president. Mr Reiman has repeatedly denied allegations he secretly amassed billions of dollars of assets in the telecom sector with the help of Mr Galmond, his Danish lawyer, who has claimed in court testimony he was the beneficial owner of Ipoc." Most readers of this posting will need no introduction to this character, and will, I'm sure, will be totally 'gob-smacked' by this astonishing, odious, almost unbelievable granting of this diploma. To make matters even worse, it was granted and signed by the current CEC chairman Volodymyr Shapoval, who entered the CEC as part of Yushchenko's quota. Some argue that the rulings of the CEC are nothing to do with the president, and because no-one was ever charged or found guilty of falsifying the 2004 presidential elections, Kivalov must be considered pure and above reproach. However, the Supreme court did rule that during the presidential elections in 2004 the CEC and its chairman at that time, Kivalov, did not fulfill their legal functions properly, and their decisions were made not in accordance with the law - hence the re-run second round of voting. It is left to Yuliya Tymoshenko, not for the first time, to uphold the tattered remains of the honour of Ukrainian politicians, in a statement issued on the Batkivshchyna site. She points out that this award encourages officials to cheat any future elections, and reduces the likelyhood these elections being fair. She appeals to the chairman of the CEC to withdraw the diploma granted to Kivalov, and warns that she will not remain silent while awaiting the formation of a democratic coalition in parliament. "In the long term, it’s the Ukrainian nation and its people that suffer from the current political deadlock, lack of unaccountability and disrespect for the rule of law...Politicians created a system in which a small circle of politicians divide power among each other and a system of political unaccountability thrives.."
Co-incidentally, an illustration of this system is provided in a piece in today's 'Ukrainska Pravda' entitled: "From the life of the nomenklatura elites: the property of Ivan Plyushch", which describes how Plyushch - a former VR speaker, and currently National Security and Defence Council secretary close to the president and his secretariat, just two days before the 30th September VR elections, asked the president to help him obtain permission from the Cabinet of Ministers to transfer ownership and build a house on a plot of land owned by the Ukrainian state. The dacha in which Plyushch resides right now, in what the British call 'grace-and-favour' accommodation, is located on this plot in the elite Pushcha Vodytsya suburb of Kyiv. On 1st October president Yushchenko writes to PM Yanukovych to sort the matter out, and Yanuk promptly does this, even though, strictly speaking, the president no longer has the authority to forward such directives to the KabMin. By October 3rd Yanuk instructs minister Azarov to grant approval, and by the 5th, the ministry of Justice has also rubber-stamped a positive decision. The speed with which everything was resolved, by Ukrainian standards was truly miraculous. Of course this has nothing to do with the fact that Plyushch is one of the main proponents in the NUNS camp of a wide VR coalition with PoR, in which he would be one of the favourites for the VR speaker's chair.. Some interesting speculation from the excellent Mustafa Nayem and Serhiy Leshchenko in 'Ukrainska Pravda'. They propose three possible scenarios on how matters could develop in the creation [or otherwise] of a ruling coalition in the VR. Against this background the President remains only legitimate institution of authority in the country. But the Party of Regions, against whom this war was begun, are willing to go along with the situation, grasping for the chance to temain in the authority, even in the role of 'acting government'. The vote in the newly-elected VR to elect a speaker could well fall through [Vyacheslav Kirilenko is the favoured candidate from BYuT/NUNS, but there are deputies in NUNS who will not vote for him], and parliament [with the help of PoR] could select a figure acceptable to PoR e.g Ivan Plyushch or Volodymyr Lytvyn. Logically the next stage would be to create a broad coalition. However, for this to occur NUNS would need to sort out certain internal procedures - i.e. to make a decision at the level of the individual fractions that make up NUNS. It's reasonable to assume that out of the 72 future NUNS deputies less than half would vote for a wide coalition or "shirka". To do so would expose themselves to accusations by Yulia Tymoshenko of betrayal. In the absence of a coalition the cabinet of ministers headed by Yanukovich would continue to fulfill its duties. The President would for sure insist on the resignation some of the more unpleasant ministers e.g. Nestor Shufrich and Mykola Rudkovskiy, and insist his own man was appointed minister of internal affairs position, but Yanukovich could probably accede to these demands. The threat of the "oranges" reuniting would provide the President complete support of the Party of Regions and, possibly, even the Communist party. As a result, Yushchenko would remain the only fully authorised institution of authority in the country. Meanwhile Yulia Tymoshenko is increasing her co-operation with Yuriy Lutsenko and Vyacheslav Kirilenko. In the event that Tymoshenko's bid to become prime minister fails, the leader of BYuT will do that which voters have expected since September 2005 [when she was sacked from the PM's position by Yushchenko] - commence a campaign of attack against Viktor Yushchenko and call for early presidential elections. Alliances of convenience and subsequent betrayals are a characteristic of contemporary Ukrainian politics. Meanwhile, behind-the-scenes deals are continuing to be thrashed out in an attempt to assemble a workable coalition in the newly-elected Verkhovna Rada. Tymoshenko knows better than anyone that her plan to lead an orange coalition could be scuttled by just a handful of turncoat NUNS or BYuT deputies - those who would prefer a grand coalition with PoR. According to an article in 'Gazeta po Kiyevski', she has been busy trying to gain support of the 20 Lytyvyn bloc deputies for a while now, in order to achieve her aim and become PM again. Although she has been unusually quiet, signs are her attempts have a reasonable chance of success. Hints of a possible arrangement between Lytvyn and Tymoshenko became public toward the end of last week. According to 'Gazeta po Kiyevski', Lytvyn will support Tymoshenko, but will not formally enter the "orange" coalition. He would rather take up a pragmatic 'pick and mix' neutral position. The negotiations between Tymoshenko and Lytvyn have messed up the plans of head of the presidential secretariat Viktor Baloga in particular, and Lytvyn will now be under great pressure from PoR and some elements in NUNS to change his mind. Yushchenko continues to leave the door open for a possible broad coalition, so a working relationship with Yanukovych needs to be maintained, particularly as the 'bottom may drop out' of any BYuT-NUNS-Lytvyn bloc coalition. Yushchenko has successfully strengthened his own position since dissolving the VR in April, taking advantage of a window of opportunity whilst Yanukovych is acting PM, but Tymoshenko not yet heading the Kabmin. He has strengthened his control over the sylovyk sectors, and rotated oblast governors, which he could hardly do with Tymoshenko as PM - Yanukovych has not protested. He has personally overseen gas affairs with Russia, with Yanuk's co-operation, so enlarging his own, new, more 'hands-on' personal image. PM Yanukovych retains some hope of hanging on to his post in a grand parliamentary coalition. And if coalition-building in the VR drags out to a fruitless stalemate, he could continue as acting PM - retaining the loyalty to the President - a situation which could well suit the [more dynamic] president too. For this reason Yanukovych has avoided conflict, and, on the contrary, has adopted a constructive attitude ready for broad compromises. Even if he is thrust into opposition, a reasonably well-developed working relationship with the president means that some influence would be retained by Yanukovych - this could bring important dividends in the near future. Cordial relations with the president could even ensure that Yanuk's significant newly-acquired properties and assets would be protected from Tymoshenko-led authorities. Today's Ukrainska Pravda runs an article in both Ukrainian and Russian, which describes the uniquely close friendship and ties between Saakashvili and Yushchenko, and Saakashvili and Tymoshenko, and criticizes, [in my view quite correctly] these orange politicians for their feeble reaction to the recent events in Georgia. "That which happened on 7th November in Tblisi sets very bad precedent. In next few years much can happen in Ukraine. And today's method of resolving the conflict in Georgia can become an example to be copied in the future, not necessarily for Yushchenko, but for another, less democratic, president than the current one. And the absence of an adequate reaction from the oranges, which should have been made now, may stimulate someone to act in Kyiv in the same way as in Tbilisi." "I agree with Davyd Zhvaniya, who said that it was not right to compare events in Georgia and in Ukraine, because after the events in Kyiv in 2004 the Ukrainian nomenklatura failed to put into place the kind of total control over society and state that the Georgian nomenklatura managed to do. This was because the camps personified by Yushchenko, Tymoshenko, and Yanukovych all have different interests. And in this sense Ukraine is a much more democratic country than Georgia; and in this sense in Ukraine there exists, even in a limited form, freedom in the informational mass media. It is really the differences in interests that rescues Ukrainian society, and this is an important lesson not only for Georgia, by for other countries of the post-Soviet space. In the Ukrainian variant, there are two routes. There is the direct route to Poland, with its normal democratic system and its participation of society in matters of state. And there is a direct route to Russia, were the nomenklatura finally sits around a round table, comes to an agreement amongst itself and establishes a regime akin to the regimes of Putin and Saakashvili. Today in Ukraine there are the possibilities to go either in one, or in the other direction. And, observing at what is happening in Tbilisi and on what is happening in Moscow, the Ukrainian citizen should simply make his choice between them." Portnikov is right: it is the seemingly endless knife-edge political struggle between the three main protagonists of Ukrainian politics, of which everyone complains, that is actually the best guarantee for Ukraine's democratic well-being in the future. In the last presidential elections in Georgia in January 2004, Mikheil Saakashvili received 96% of all votes cast..
"Today's gas import scheme [for importing three-quarters of Ukraine's gas needs from Central Asia and Russia via monopolistic trader RosUkrEnergo] is dubious from the the ethical point of view," said president Yuschenko in an interview several days ago. Even chairman of Gazprom's board of directors, Dmitriy Medvedev, one of Putin's closest buddies, recently spoke of the possible liquidation of RosUkrEnergo. But, as with many matters in Ukraine, reality is something quite different. Ekonomichyeskiye Izvyestiya reports that by the end of the week the price of gas for Ukraine for next year will be fixed, but that the annulment of the agreement of 4th January, 2006, whereby RosUkrEnergo was nominated monopolist intermediary for supplying gas to Ukraine until 2011, will not be considered at all. In spite of statements by President Victor Yushchenko that negotiations on the price of gas for Ukraine must be conducted at intergovermental level, the big decisions will be made by people behind Gazprom, the Ukrainian state gas company Naftogaz Ukrainy, and Swiss-registered middleman RosUkrEnergo. [RUE is 50% owned by Gazprom, and 45% and 5% by Ukrainian front-men Dmitriy Firtash and Ivan Fursin respectively]. 'Gazeta po Kyevski' is puzzled why Yushchenko today met Fuel and Energy minister Yuriy Boyko, National Security and Defence Council head Ivan Plyushch, and Minister of Foreign Affairs Arseniy Yatsenyuk, and suggests it was to give secret directives to Boyko before the minister goes to Moscow and the price of Russian gas for 2008 is finalized. The deputy head of the pressa's secretariat also attended. All those present left the encounter without comment. Yesterday Gazprom had announced that Ukraine's mysterious $2 Bn gas debt had been paid off, but how this huge debt had been allowed to build-up in the first place is unknown. And why is the president entrusting Boyko, a very shady character to say the least, and now a PoR deputy-elect, on such a vital mission? They probably want to sort out gas supply deals with Gazprom/Kremlin before [or just in case] Tymoshenko becomes prime minister again. She has vowed to clean up Ukraine's entire shadowy gas procurement business. It was Tymoshenko's loyal adjutant Oleksandr Turchynov's investigations in September 2005 when he headed the SBU, into allegedly fraudulent practices involving the transport of Turkmen gas to Ukraine by two companies, Eural Trans Gas and RosUkrEnergo, that eventually led to president Yushchenko dismissing prime minister Tymoshenko and her entire cabinet to the dismay of orange supporters. RosUkrEnergo is just too efficient and useful a siphon mechanism to be scrapped..
Tymoshenko to disrupt VAT gravy train? A big reason why PoR and its businessmen sponsors will do all they can to prevent Tymoshenko becoming PM was highlighted in an article in 'Ekonomicheskiye Izvyestiya' several days ago. The newspaper claims the first legislative initiative of a Tymoshenko-led government would be to sort out the Value Added Tax system and ensure that it is applied in a different manner, so that dubious tax credits and suspicious rebates are eliminated. Hardest hit by such a scheme would be the large export-orientated enterprises - many of which are located in PoR strongholds. Good background on Boris Penchuk's astonishing volte-face [see previous blog] is provided [in English] in 'Dzerkalo Tyzhnya'. Their article suggests that Kolesnikov was arrested in April 2005 shortly after he had refused to "give away his shares in Rinat Akhmetov’s enterprises" to..Petro Poroshenko, one of Yushchenko's 'dear friends' and head of the National Security and Defence Council at that time. A couple of days ago leading editor of the sensational anthology "Donetsk Mafia", Boris Penchuk, admitted at a press conference that he "had slandered Boris Kolesnikov under pressure from the unscrupulous Yuriy Lutsenko." Kolenikov is one of Party of Regions 'top bananas'. The book is the most detailed collection of articles and photographs on the grizzly events that took place in the Donbas in the early and mid-nineties, that has thus far been published. Penchuk said he was subsequently taken by members of the 'organy' to Kyiv, where he was kept under house arrest for several months, and that he was forced to sign a statement which provided evidence for Kolesnikov's arrest. After several months in prison, Kolesnikov was released without charge. Penchuk now claims his dispute with Kolesnikov was just a "small civil matter...transformed into political repression", adding, "I was a tool in unscrupulous game of an unscrupulous man [Lutsenko]." He said he initiated the press conference to prevent Yuriy Lutsenko ever returning to the Ministry of Internal Affairs in a BYuT-NUNS coalition. As late as this August, Penchuk was reportedly suspiciously poisoned. In Donbass today, even many PoR supporters consider that amongst PoR's inner circle, Kolesnikov probably is the one that has most skeletons hidden in his cupboard. So, a complete volte-face from Penchuk. Now an article in 'Ekomicheskiye Izvestia' claims head of president Yushchenko's secretariat Viktor Baloha, and Kolesnikov, with whom Baloha has cordial relations, may be behind this campaign to blacken Yuriy Lutsenko and prevent him from gaining the powerful 'sylovyk' position of minister of internal affairs. The article claims they favour Valeriy Heletey for this position. This is the same Heletey, currently head of the 'gosokhrana', whom earlier this year colleagues of the then minister of internal affairs Vasyl Tsushko had claimed had poisoned Tsushko. Most accounts said he had suffered a heart attack after leading the storming of the Prosecutor-General's offices. Heletey, at a press conference on 1st June denied he had had anything to do with any assassination attempt, and called the allegations linking him to Tsushko's illness 'political blackmail'. Ukrainian politics..you couldn't make it up. At yesterday's cabinet of ministers council, Viktor Yanukovych made it clear he intends to continue to work as prime minister. Most surprising to the members of the media and cabinet present was the fact that, it in every way possible, he supports Viktor Yushchenko's initiatives, several times mentioning the leading role of the President among the institutions of state authority. He read out his half-hour speech speech at the beginning of the meeting, concentrating not on the events of the past week, but on the forecast of trends of development of the country over the intermediate and long term. The signal given by Yanukovych is he is not intent to leave the post of the Head of Government. Officials present in the hall were the same opinion, making comments to correspondents to the effect: "Yes, this is the broad coalition road map". Viktor Yanukovych reminded those present that the election process was complete and soon parliament will renew its work. He named the productive collaboration of parliament and government as their primary task, after calling upon the President to become the guarantor of this collaboration. The premier then enumerated questions, on which he intends to concentrate the attention his government; in particular the adoption of the state budget, entry of Ukraine into the WTO, acceleration of judicial and agrarian reforms, and overcoming growing inflation. Yanukovych declared a readiness to acknowledge "errors of the past". "We, and you, should recognize them, and highlight them," he said. The prime minister supported Viktor Yushchenko's ideas on reforming the political system in the country: "The contradictions which exist today must be removed, spheres competence regulated, and a new a hierarchy of democratic state institutions constructed," said Viktor Yanukovych. The Head of Government reported that without a shadow of doubt, efforts of the branches of authority will be soon united. He several times mentioned the President as the higher authority of decision making. The Premier even intends to examine the question of increases in prices of the basic commodities together with the head of state. Among other things, Mr. Yanukovych promised to soon conduct a session of government dedicated to check whether orders of the President and government are being fulfilled. Several months ago he had declared that the President does not have a right to give to the government instructions. However, when Viktor Yanukovych spoke of reformation of the economy of the country, he took up a position different to that of the President. The PM considers the role of state in the regulation of the economy must be increased, and called the stance of politicians who ask the KabMin not to interfere in market processes: "economically short-sighted and politically irresponsible". The priority of the government according to Yanukovych is fighting price increases. He is even ready on Friday 2nd November, together with the President, to take part in an extended conference with experts and leaders of local organs of authority, in order to resolve this question. He accused the latter of inactivity on tackling price increase. The Head of Government gave special attention to increases in the prices of the petroleum products. He directed fuel and energy minister Yuriy Boyko to complete negotiations with Gazprom on the price of gas for Ukraine within the next ten days. "We all heard the President expressing his position on this subject, that the price of gas, [mentioned by representatives of Russia] is unacceptable for Ukraine. According to our calculations, it should not be above $150-160 per thousand cu.m." noted the premier. He called Ukrainian delegation to raise the question of revision of cost and delivery of gas in the Ukraine. in the course of negotiations with the Russian side. It is remarkable however, that during his appearance Mr. Yanukovych did not mention the possibility of increasing transit tariffs for gas passing over the territory of Ukraine. But Yuriy Boyko, who left immediately after the appearance of premier, reported that this question will also be brought up during negotiations. 'Regiony' spokesmen are more openly talking about 'serious concessions', 'serious compromises', and about 'controversial questions' being removed beyond the [negotiation] framework' during the creation of a broad coalition, when its platform is being formed'.